With the release of The Force Awakens this past winter, a huge narrative gap was created – a 30-year narrative gap in the Star Wars universe! While the fall’s Star Wars Aftermath helped us gain a sense of what happened after the Battle of Endor, there had not been anything about the First Order and the Resistance, besides what we find in Before the Awakening. This is where Star Wars Bloodline comes in. 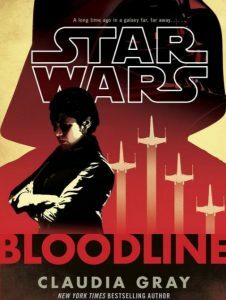 Primarily focussing on Princess Leia, Star Wars Bloodline takes place five years before The Force Awakens, with Princess Leia serving in the Senate of the New Republic. However, early on, finding the decision-making process of the Senate ineffective, she yearns to leave it, perhaps to travel around with Han Solo. While the early part of the book involves itself with politics and interpersonal maneuvering that comes along with it, as well as an appropriate amount of tedium, the book really picks up as it moves into mystery-mode. Perhaps this may be my own particular thing – to be fascinated with mysteries, moreso than political matters, but the story certainly gains momentum once it gets off the ground with the sleuthing involving Princess Leia and a senator from the opposing party. The mystery at the core of the story is a thrilling one and one that hints towards the First Order, although the clarity of that isn’t revealed towards the end (as to be expected with a mystery). Through the mystery, we learn more about the ineffectiveness of the senate of the New Republic, which is most frustrating for both Princess Leia and the reader. Nevertheless, it is a helpful guide to some of what is going on at the time. The final significant piece is that Princess Leia wrestles with revealing her father’s identity to her son. Even more, she, herself, wrestles with this matter – the identity of her father. Before she can reveal the identity of her father, however, the truth comes to light and gets publicized in a most unfortunate and devastating manner to Princess Leia. It is not only personally devastating to Princess Leia, but also comes at the cost of her political career. Worse, she is unable to have come forth with this important information to her son, before it gets to him (presumably, even though he is not in the story (this, by the way, leaves open the door to a very fascinating story involving how he finds out…)). Ultimately, the book ends in Princess Leia departing the Senate (this shouldn’t be a spoiler – it has to happen before The Force Awakens) and creating the Resistance. While the nomenclature of her movement is not included, the story does certainly tell us the impetus for getting it going: Princess Leia’s frustrations at the deadlocking of the Republic Senate (not unlike the Old Republic) and the need to do something. One final note: this book is authored by Claudia Gray, who also authored Lost Stars, one of the best (if not the best) Star Wars books in the past couple of years. I was curious to see how this book would do, especially considering how she would do to follow up her awesome job on Lost Stars. Gray’s writing does admirably well and one thing at which she excelled, I think, that made this book particularly strong (in addition to the story/plot) was how she captured the emotions, dispositions, and attitudes of the individual characters, helping shape them and the story writ large. This is an important and easily overlooked characteristic, but important to the overall strength of the book. If you haven’t yet read it, I recommend it!